In John Keane’s introduction to his sweeping new survey history, The Life and Death of Democracy, he lays out a promising—and ambitious—task for the project. “With an even hand,” he writes, “and one eye constantly on the past, the book tries to expose the worrying lack of clarity about what democracy means today” (xxxiii). Such a project is overdue, he argues, “simply because democracies as we know them are sleepwalking their way into deep trouble,” and his book’s “strategy of challenging humbug…gives voice to what growing numbers of people quietly think: that despite all of the huffing and puffing, the so-called global triumph of democracy may well turn out to be a campfire on ice” (xxxiii). Keane—a fellow at the liberal Institute for Public Policy Research, a biographer of Tom Paine and Václav Havel, and a leading theorist of civil society—might be late coming to such conclusions. I began my reading, however, from the conviction that the theoretical and practical distances that separate social liberals like Keane from the Marxists of various stripes that I more habitually read is (still!) less than that between Keane and the comparatively unnuanced protagonists of neo-liberal democratization. Precisely because of his liberal credentials, in fact, it seemed to me that Keane’s voice (while not, perhaps, as incisive or as empowering as he might like to believe) could help to carve out space for a new popular front against the most egregious excesses of imperium. Or, more modestly, I hoped his claim that the book “deliberately adopts the widest possible plurality of perspectives on the subject” (880) might mean that it attempts to address the almost completely irreconcilable ways in which the rhetoric of democracy has been deployed within liberal and revolutionary discourses over more than two centuries, and the ways in which such polysemy has contributed to the difficulty that people working within those two traditions encounter in seeing what they might have in common. 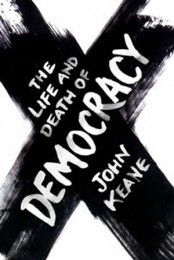 The book is structured according to a three-epoch periodization, in which Keane makes a very broad distinction between what he calls ‘assembly democracy’ (e.g. Athens, or more interestingly, Sumerian Mesopotamia), ‘representative democracy’ (parliamentary models born in late Medieval Europe and their export and development through the processes of mercantilism and colonialism), and ‘monitory democracy’ (the chaotic post-1945 form characterized by institutions of civil society and ‘communicative abundance’). Keane seems to take pleasure in toppling many of the flimsy foundations of the familiar story. He is careful, in the section on assembly democracy, to examine the mythic continuity between Athens in the 4th century BCE and Philadelphia or Paris of the late 18th century. He makes a convincing argument that much of what we think we know is the product of aggressive myth-making by classicists like George Grote, intended to serve egalitarian pretensions of 19th-century democrats and to bolster the historical exceptionalism underwriting the imperial project of European civilization. He reminds us that Athens’ centrality in the historiography of democracy is due at least partially to the fact that it was powerful and partially to the fact that it left records of its civic procedures and processes of governance. It follows, then, that not only were the earliest democratic experiments likely much earlier and elsewhere (though still, in Keane’s narration, in Asia Minor), but that there were likely many contemporary though less bureaucratic city-states whose democratic history has been lost to posterity. He stresses that democracy did not disappear with the emergence of the Roman Empire, but was maintained for centuries (along with much of Hellenic culture) by practitioners of Islam. He argues (all but spelling out the analogy with the United States of today) that Athens was aggressive, at war as often as at peace, and that the leisure of its democratic and civic life depended upon constant foreign conquest and the labor of slaves who formed the majority of the population—though he is quick to point out that Athenian citizens also pioneered ambivalent hand-wringing among the privileged about structural injustice. In his section on representative democracy, Keane’s disregard for bottled history becomes more circumspect, and his ideological commitments begin to emerge more clearly as he traces the evolution of proto-parliamentary formations in Spanish church councils of the 12th century and their early coalescence into self-consciously democratic (and commercial) forms in the Netherlands, through a golden age during which Westminsterian parliaments spread and developed as the benign epiphenomenon accompanying British imperial expansion, and ending with the rapid rise of anti-democratic forces in the first half of the 20th century. He shows that American political democracy emerged primarily from the chaos of commerce and civil association described by Tocqueville, rather than from any intent of the country’s aristocratic framers. He carefully catalogs the diversity and creativity of democratic forms which sprang up in Latin America during the confusion of monarchical loyalties that resulted from the Napoleonic Wars (well before Jacksonian democracy took hold to the North), and pulls no punches when deflating myths of US innocence in the scramble for colonial influence that followed the breakdown of old power structures in Europe. Here Keane’s critical rethinking of standard narratives, however, is mostly constrained to the Western Hemisphere and to the period preceding the US Civil War, to which he reflexively ascribes a “noble purpose” in contradistinction to civil wars fought in South America around the same time (427). From there, the story becomes a rehearsal of idealistic pieties in which people spontaneously begin to believe in equality and justice, a steady succession of democratic saints agitate for suffrage, French republicanism fizzles into a reactionary sideshow, and ominous clouds of nationalism and radical anti-humanism begin to gather in Central, Southern, and Eastern Europe. Along the way, Keane seems happy to ignore the rapid urbanization and industrialization of the Atlantic region as possible contributors to social unrest, and dedicates only one longish paragraph to “Some socialists and most communists, meanwhile, [who] accused [Democracy] of being a bourgeois affair, a mask for class exploitation” (572). On the next page, the utopian “language games of intellectuals hostile or unsympathetic to democracy suddenly sprouted devils’ horns” (573) in the form of totalitarianism that “first appeared in Russia and Italy and soon spread to Weimar Germany, whose permanent crisis paved the way for the rise of Hitler” (575). … as if the broken-hearted spirit of democracy, banished from earth to the skies above, had suddenly summoned a cloud, thrown a saddle over its white mane, then ridden it earthwards, landing at some spot south of the snow-peaked Himalayas, where it galloped off to consummate its love for the sunlit landscape that is today called India (585). In that sunlit landscape, he explains, the British Empire (the most benevolent in a typology of Empires that ranks the USSR as the most authoritarian and the Ottoman Empire as somewhere in the middle due to its “partial power sharing”), has “ironically … acted as a midwife for new democratic institutions” (507). India’s noisy and uneven democracy, then, is a prodigal redemption for British arrogance that could also “laugh in the face of pseudo-scientific and fatalistic propositions that had insisted that there was a causal—perhaps even mathematical—link between economic development and political democracy” (586). Chaotic and impoverished India becomes the paradigm for a post-representative democracy that (while also maintaining electoral and parliamentary processes) is simply too complex to be contained in remote quarrels between aristocratic leaders of a small group of parties. Other new and unlikely Democracies emerge in quick succession, according to Keane, and it is telling which post-colonial states (Israel, Taiwan) he includes in his list, and which ones (Vietnam, Cuba) he omits. China appears literally for the first time as the ominous shadow of India. “In contrast to China,” Keane writes, “… not only did [India] show that dictatorship was unnecessary in the so-called Third World,” but also that “unity within a highly diverse country could be built by respecting its differences” (586). Partition is only mentioned in one sentence to provide background for a hagiography of Mohandas Gandhi, and—while Indira Gandhi’s authoritarian cult of personality and the cynical Hindu nationalism of the BJP are treated as temporary (he even employs the word ‘dialectical’ on several occasions) stumbling blocks—Pakistan only appears later, offhandedly, once as a rising nuclear threat and once in a list of countries in which “democracy promotion had tangibly failed” (812). The selectivity of Keane’s narrative remains crudely apparent as he celebrates the US civil rights movement without mentioning the Vietnam war, mourns the violent suppression of democratic voices in Latin America without addressing structural adjustment, and evaluates the promise of and challenges facing transnational “monitory” institutions ranging from the United Nations and the International Criminal Court to Amnesty International, but hardly mentions the International Monetary Fund or the World Trade Organization. In the obligatory list of post-1989 democratic uprisings, he includes Ukraine’s suspect 2004 ‘orange revolution’, but excludes any mention whatsoever of Seattle 1999. Keane’s account of recent history is not entirely rosy, and he reserves critical energies for a nuanced engagement with the work of Francis Fukuyama and Samuel Huntington. 1989, Keane assures us, marked neither the end of history nor an inevitable third wave of emergent representative democracies following the surge of post-war economic development. The world is replete with anti-democratic forces, after all, in the form of the new ‘überdemocratic’ authoritarianism of Silvio Berlusconi’s Italy, Chinese neo-mercantilism, post cold-war nuclear anarchy, and apocalyptic (Islamicist) terrorism. Democracy’s future is uncertain, he argues contra Fukuyama, but exactly because its history is not over, it will thrive if it proves adaptive. I found it perplexing, in light of my initial hopes for Keane’s book, that this is the stale conversation into which he chooses to insert his most creative ideas for a democratic future, especially when there are such obvious correspondences between his dynamic vision of civil society and the more interesting work being done by Deleuzian Marxists—most obviously the popular work of Michael Hardt and Antonio Negri—which develop concepts of the multitude and the common partially by reexamining republican traditions. Surely, after such grandiose claims to historical ecumenicalism, it is awkward to discuss diffuse and spontaneous democratic eruptions or to deploy terms like ‘communicative abundance’ without acknowledging the increasing currency of such language in the literature somewhere to Keane’s left. One diagram he offers towards the end of the book to demonstrate the nonlinear interrelationship of media, civil society institutions, and government bodies seems positively rhizomatic. Is this simply the case of an intellectual who has been brought up in a particular environment and has had a particular set of experiences struggling to situate a critique within the constraints of his fluency? Maybe, but Keane—who professes in his acknowledgments to have been a student of Hans-Georg Gadamer and C. B. Macpherson, and who wrote, for example, a 1988 essay called “More Theses on the Philosophy of History” in argument with Quentin Skinner—is clearly dissembling his theoretical and critical chops. Having been disappointed in vain hopes that someone like Keane might be uniquely situated to bridge exactly this gap, I am only left to wonder towards what end he so carefully tailored the political and theoretical boundaries of his ‘comprehensive’ history. Keane, John. “More Theses on the Philosophy of History.” Meaning and Context: Quentin Skinner and His Critics. Ed. James Tully. Princeton: Princeton University Press, 1988. 204-17. Print. Randall K. Cohn is a Ph.D. student in Cultural Studies at George Mason University, where his major fields of research are political theory and art history.